While I do most of the cooking at Scrumptious Street, it's time to recognize Mr. Scrumptious' own culinary talents. He is THE sandwich maker in our home, I will surely devote posts to his yummy noshes in the future. He also is a whiz with the meats. 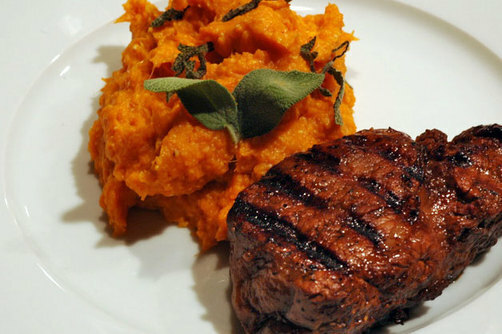 So, in this post, we have yams by me and filet mignon by Mr. Scrumptious. I intended to make this with sweet potatoes instead of yams since both Mr. Scrumptious and I prefer them to yams. Alas, sometimes we are at the mercy of the local grocer's and the gods of time when shopping on a late Sunday afternoon. I'll start with Mr. Scrumptious Fabulous Filet Mignon. Um, there is no recipe, he just threw some Worchestershire sauce, chutney, balsamic vinegar and luscious spices into a dish. He mixed it up, threw in the filet mignon and pricked it all over with a fork. Next, he flipped it over a few times in the marinade and covered it. Refrigerate it for about 8 hours. When we were ready to cook we heated up the grill pan and grilled it medium rare. Of course, when the meat is done it had to rest for 10-15 minutes, perfect for my photo shoot. For the yams, here's my recipe, to serve 4 people. Fill a pot with the yams and cold water, covering the yams by at least an inch of water and bring to boil on stovetop. Reduce heat to medium and boil gently until yams are tender and the tines of a fork slide in easily, about 20 minutes. While the yams are cooking, combine cream and ricotta in a small saucepan and heat gently. Add the nutmeg and cloves, whisking gently until yams are ready. When yams are tender, drain and mash or rice thoroughly, depending on your tool of choice. Return the yams to a very low heat, add the butter and melt completely. Slowly add the ricotta and spice cream to the yams and incorporate completely into yams. Remove from heat, garnish with sage and serve immediately. This was a lovely autumn meal, so full of flavor and simple delicate beauty. The filet combined with the spices of the yams quite well, as we were eating Mr. Scrumptious spread the yams onto the beef to get a combined bite. That's always a good sign. We paired it with the bright and fruity Bodegas Palacios Remondo Herencia Remondo Vendimia 2003 Rioja that didn't get lost in the flavors or dominate the palate. There you go again, with a post-title that gets my visuals (and appetite) going. I want to try this with what I've seen at the market - "american sweet potatoes". It's about time that I had a filet mignon too! Thanks, Rowena. I wanted to make these with sweet potatoes originally, but couldn't get my hands on them quickly enough (procrastinated too long that day). Let me know if you like them. The yams were great but I prefer the texture of sweet potatotes anyway so I expect they'd be even better. ciao!